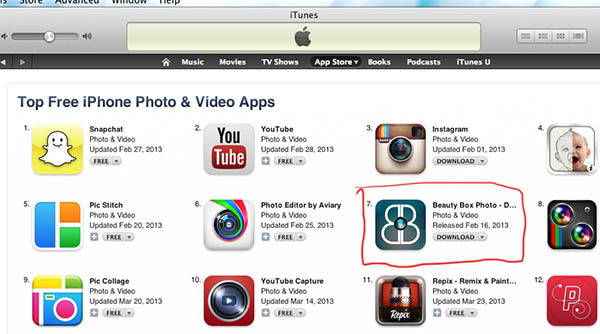 Beauty Box Photo App Got to #6 in the App Store! Given that there are over 19,000 photo apps in the App Store, getting into the top 10 is a pretty impressive feat. It requires a LOT of downloads, so we are really thrilled by it. Even more exciting is that version 1.1 is coming out in a couple weeks, adding all sorts of cool stuff. 1.0 has gotten mostly 5 stars reviews and if folks liked that, 1.1 should be really well received. Stayed tuned for all the details once it’s available in the App Store.